The 2017 Ostrava Golden Spike was billed the first European stop in the farewell tour of legendary sprinter Usain Bolt, who announced his retirement after the 2017 London World Championship scheduled for August 4 -13. Bolt, the 6’5” Jamaican, who was competing in his 9th Golden Spike meet, easily disposed of the competition, winning the 100m race in 10.06 seconds (-0.3 m/s), ahead of Cuba’s Yunier Perez (10.09) and Turkey’s Jak Ali Harvey (10.26). This was Bolt’s second race of the season, having clocked 10.03 seconds to win his season opener at the Racers Grand Prix in Jamaica on June 10th. Bolt has failed to go sub-10 seconds in his first two 100m outings. However, there is no need for alarm, as Bolt has historically slow starts to his season, only to peak at the opportune time, when gold medals are at stake. But while the festivities in Ostrava were centered on Bolt and rightfully so, it was the 24 year-old South African, Wayde Van Niekerk who stole the spotlight. Van Niekerk breaks 300m world record. Van Niekerk ran a control race and decimated the rest of the field in the men’s 300m to stop the clock at 30.81 seconds, a new world record eclipsing the old mark of 30.85 set by American Michael Johnson back in March 2000. Van Nierkerk new time also erased the meet record of 31.97 seconds set by Usain Bolt back in May 2010. This is the second world record for Van Niekerk who established the 400m world record of 43.03 seconds at the 2016 Rio Olympics, which incidentally was held also by Johnson (43.18). Based on his 300m world record performance yesterday in the Czech Republic indications are that Wayde who is in fantastic form, is likely to lower his current 400m world record. It was also reported that the London World Championship organizer are adjusting the schedule to allow Van Niekerk to pursue the 200/400m double. This could lead to a dream match-up in the 200m finals as Bolt is likely to purse the 100/200m sprint double. 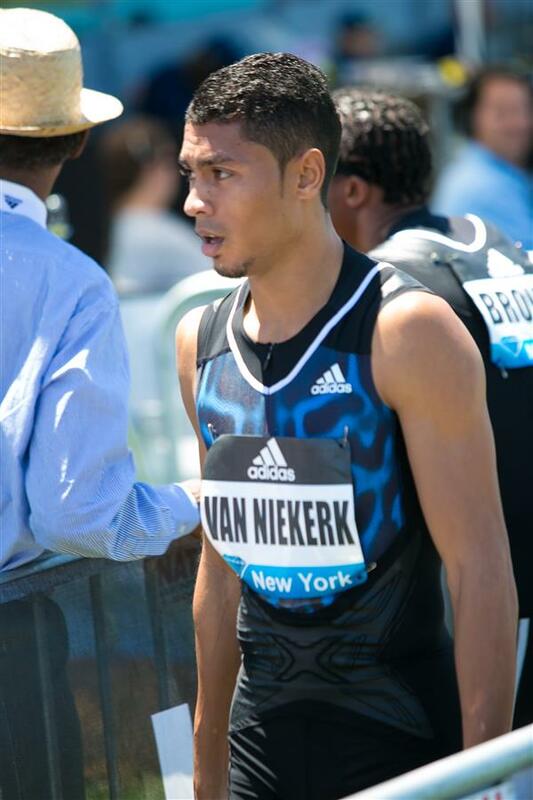 Van Niekerk is establishing himself as a versatile and formidable athlete as he is the only man in history to have personal best times of 9.94 (100m), 19.84 (200m) 30.81 (300m) and 43.03 (400m). The 200m finals at the London World Championship could provide some answers. A win for Bolt in the 100/200m would further cement his legacy while a win by Van Niekerk could represent a changing of the guard. Stay tuned. Marie Josee Ta Lau of the Ivory Coast won the women’s 200m in 22.44 seconds (+1.2m/s) ahead of South Africa’s Alyssa Conley (23.03). American Christian Taylor captured the men’s long jump title with a leap of 17.57m, a new meet record. Czech Republic’s Tomas Stanek won the men’s shot put in front of his hometown crowd with a throw of 21.63m, well below the world-leading mark of 22.65m set by American Ryan Crouser on June 25 at the USA Trials. Germany’s Thomas Rohler won the men’s javelin event with a thrown of 91.53m, below his world leading throw 93.90m, ahead of his countryman Johannes Vetter (87.88m).